Catholics are all about sacraments. Perhaps this is a surprise to you, but it’s true. Theologically, we believe that the sacraments are the ordinary way that God dispenses his grace to mankind. With that in mind, take a moment to reflect on the fact that every sacrament we celebrate as Catholics has a material component. Water is used in baptism, oil in confirmation and anointing of the sick, bread and wine in communion; the physical world expresses things – it’s just part of human nature that we see symbols in the world around us. Also, each of the material elements we use in these sacraments points to the sacramental reality being created. Take baptism, for example. We use water to clean ourselves; in baptism, we are washed of our sins. On top of that, water is a (I’m told rather messy) part of childbirth; in the sacrament, we are reborn (of water and spirit) as adopted children of God. It’s an important part of sacramentality that the normal material usage of something is raised so that the normal usage can point to the reality being conveyed. That brings me to my lament. In the age of social media, email, iMessage, Skype, FaceTime, text messages, voicemail, and even, for the more antiquated among us, telephones, we have lost the importance of writing letters. Now, if you don’t already agree with me, you are thinking something like, “But why would I do that? I can just email or call or Facebook or FaceTime or iMessage or Skype or text‽*” You could. And the message would be conveyed effectively — perhaps even better. But something else wouldn’t be, at least not in the same way: presence. This truly hit home for me when I received a letter early on in my time at seminary. It was from a young lady who was a friend of a then fiancé of the son of a friend (yes, really that far removed). Her little letter started with a note that “everyone loves getting mail!” (as long as it’s not a bill). She was right. Ever since then, any time I go to the mail room here at the seminary and find a letter for me, it brings me a moment of great joy! Someone thought enough of me to take a few minutes from an otherwise hectic and busy life to scribble down even a few lines, seal them in an envelope, and entrust them to strangers to deliver to me. Think about this for a minute. When you write a letter, there is a physical object that you hold in your hands. On that object, you, with your hands write with a pen or pencil (or paintbrush – I’m not picky). That object is then carried by multiple persons to set in another’s hands. We are not merely spiritual beings; we are a composite of spirit and matter. We have to remember that. Because of that, there is a significance to material objects that can be held in our hands, handed to each other, shared, given, a significance that no technology can imitate or replace. If you wear perfume or cologne, a letter can even smell like you! God knows our need for material significance in the messages he gives us. He knows that’s how we relate to the world. The Word became written text for mankind in the Scriptures. The Word became flesh in the person of Jesus Christ. If God, who is far more removed from us than the digital world (in one way), can see that necessity that he express himself and his grace to us in material forms (in Jesus Christ and in the Scriptures and in the Sacraments), why is it so difficult for us to see that there is just something lacking when we pretend that an email is as good as a letter or a text is as good as a thank you note? Here’s some food for thought. An email, as much as it can convey information, cannot convey the moment of self-sacrifice that a paper letter expresses. When I write an email, I sit at my computer (or, worse, pull my phone from my pocket), type a few lines, and click send. When I write a letter or a card, I pull the stationery or cards from a drawer (can’t replace that with the phone in my pocket), pull one of my pens from it’s hiding place, make sure there’s ink in the pen, sit down and write (and I write FAR more slowly than I type). When I’m through writing, I have to address an envelope and put a stamp on it – even the few cents of that stamp represents a small sacrifice – I could totally buy a coke with that! I have to entrust it to the postal service, and I have to wait. 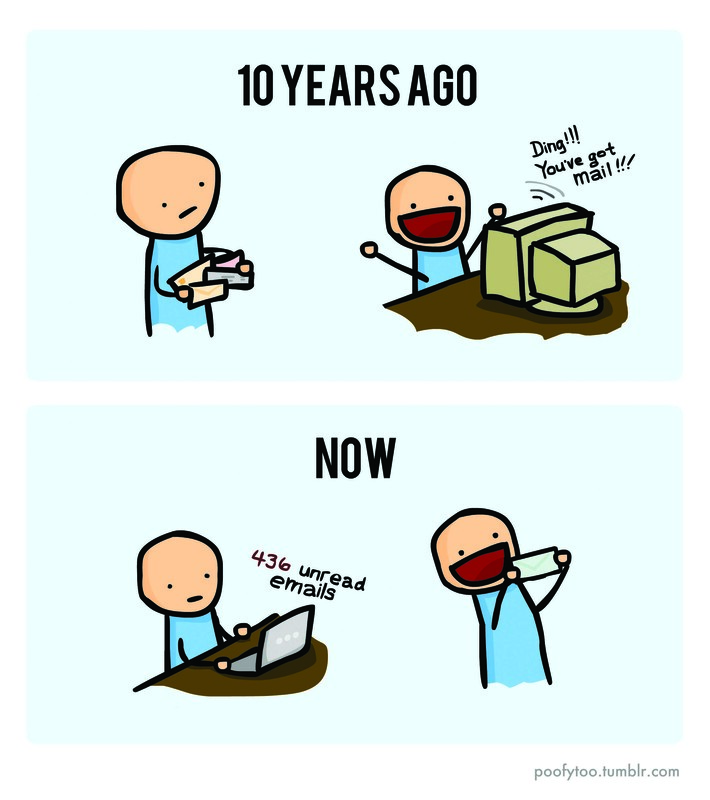 There is no instant gratification with snail mail; I have to wait days for my loved ones to receive a letter. Then, sometimes, I don’t even know they’ve received it. In a way, it is that uncertainty that reminds me that I didn’t write the letter or card for me; I wrote it for them. I’ve been thinking about all this for a while. I actually wrote the first first stub for this post well over a year ago. It’s part of the reason I started writing letters to people. It’s the logical next step of my reflection on the disposable nature of the society we have built. So, if you are reading this, take a minute; grab a piece of real live paper (if you have stationery, all the better), and write real words on it to send to someone you love. You’ll have to trust me. When they receive it, it will be a joyous moment for them. Trust me. As a coda, let me add one exhortation. If you receive a gift, large or small, send a thank you note. In high school, my senior English teacher was a lady by the name of Miss Hazel Haley. I was a high school senior in 1995-1996. She had been teaching at the same school since 1937. She was such an institution that she taught in the Hazel Haley Building (yes, the building at the high school was named after her while she was still teaching there!) We finally lost Hazel Haley about a year after she retired in (I think) 2007 – 70 years after she began teaching. Anyway, one of the last lessons she taught us as we were about to matriculate was to write thank you notes to everyone who gave us gifts. A friend who I asked to read this blog entry for me before I published it pointed out that his wife does the same. I’ll use his words here (even though I didn’t ask in advance) since, in my line of work, I won’t have a wife or children of my own to pass this on. * Sadly, the interrobang never really caught on as a punctuation mark – but it should have. And that’s a matter for a completely different blog entry. Beautiful! Handwritten letters are definitely the best gifts to receive. Still, I am the worst. I write cards and letters but end up not mailing them. Yikes. Thanks for the encouragement to go the distance and actually make it to the post office.